In a handout provided by the State Department, North Korea's Kim Yong Chol shakes hands with Secretary of State Mike Pompeo, in New York. 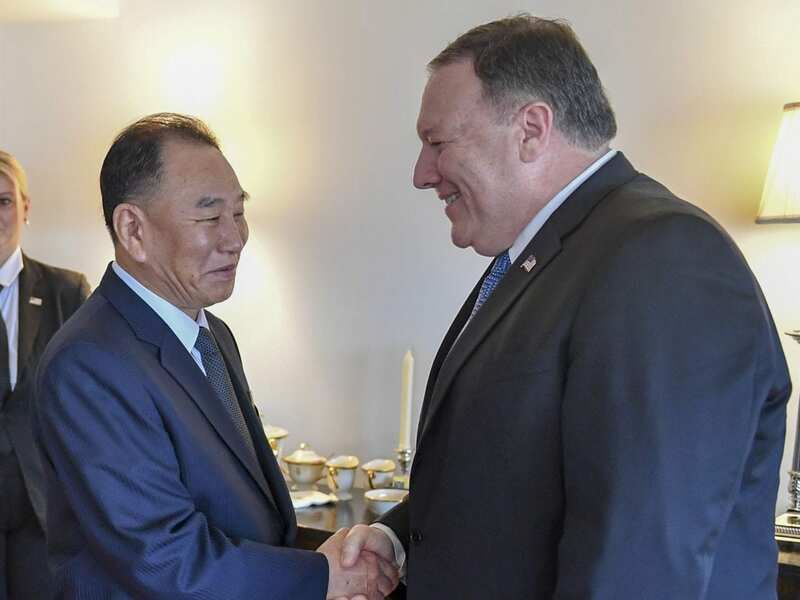 Secretary of State Mike Pompeo met with a top North Korean official over dinner in New York on Wednesday, as the two sought to salvage a June 12 summit between President Trump and Kim Jong Un. The summit, planned since April, was called off just a week ago by Trump amid a renewed round of heated rhetoric from Pyongyang and concerns over whether North Korea was sincere about “denuclearization.” Within days of cancelling the summit, however, there was talk of getting it back on track. The meeting between Pompeo and Kim Yong Chol, North Korea’s former military intelligence chief, marks the highest-level official visit by a North Korean to the U.S. since 2000. Pompeo’s office said the two officials were planning a “day full of meetings” on Thursday, but there was still no certainty on whether the summit would even take place. As the two were meeting, so were lower-level U.S. and North Korean diplomats – both in Singapore, the planned venue for the historic summit, and at the Koreas border. In recent months, Pyongyang had toned down its normally bombastic tone aimed at the U.S. and South Korea. In a rare meeting in April, North Korean leader Kim Jong Un and South Korean President Moon Jae-in shook hands at the heavily fortified border in a gesture of good will that seemed to presage a broader rapprochement. Later, in an apparent effort at damage control, Vice President Mike Pence seemed to only make matters worse, suggesting that sitting down for talks was the only way Kim Jong Un could escape such a fate.